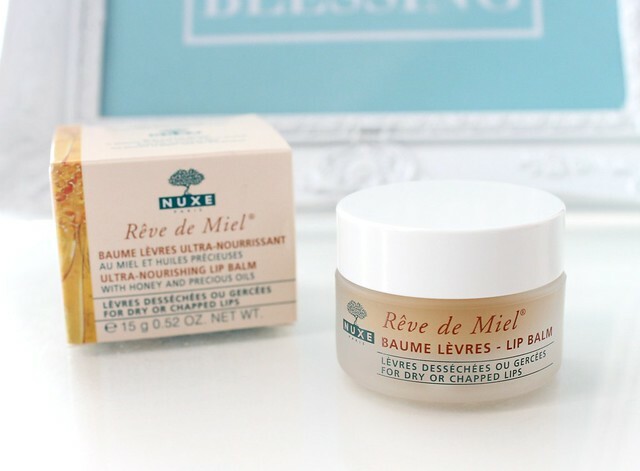 If like me you're one of those people that always seeems to have chapped lips then I may well have the answer in the form of NUXE Reve de Miel lip balm - the best lip balm I've EVER used! Seriously, this stuff packs a huge moisturising punch. In your face chapped lips! So the first thing I love about this product would have to be the exceptionally cute packaging - the lip balm comes in a little glass jar which makes it feel so luxurious and it looks lovely sat on my dressing table too. It also has that really satisfying sound when you unscrew the lid - I can't explain it through writing but the sound of the lid and the glass clicking together is strangely satisfying! Yes I know - I'm clearly very easily pleased. 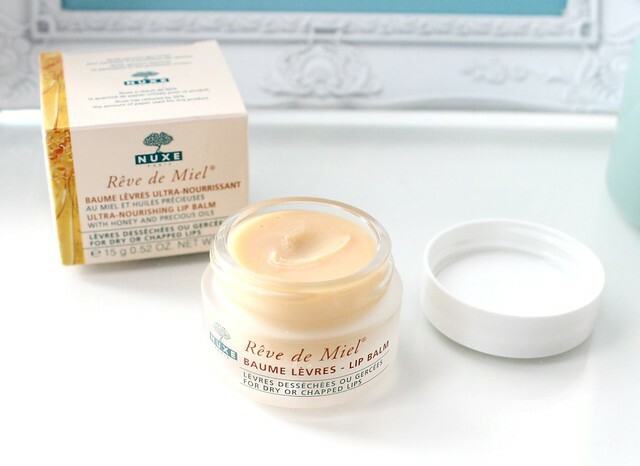 Unlike a standard lip balm that's quite sheer and glossy on the lips, the Reve de Miel lip balm is very thick and matte. When I first tried it, I wasn't sure if I was keen on the unusual 'whipped' texture as it didn't feel like it was that moisturising. However, after using it for a while, I now prefer this texture as I can really slather it on morning or night and not be left with any greasy residue. The thick texture also provides a huge moisturising punch too and the concentration of natural ingredients like honey, plant oils, shea butter and grapefruit essence ensure the lips are fully soothered and hydrated. 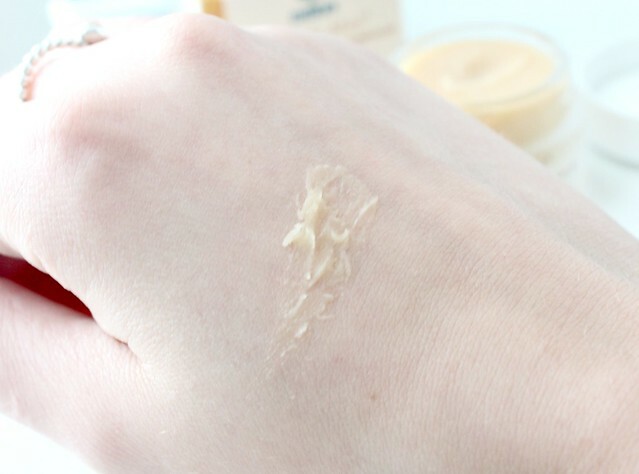 The honey ingredient also means this balm smells delicious which is always a bonus for me, especially when its something I'm going to apply every day. I tend to slick this all over my lips before bed as the final step in my skincare routine and when I wake up in the morning my lips feel exceptionally soft and supple. I've never found a lip balm that has made my lips as smoothe as this one so I'd definitely recommend giving it a go if you suffer with dry lips. It can also be used on sores and light burns too - a good multi-purpose product. 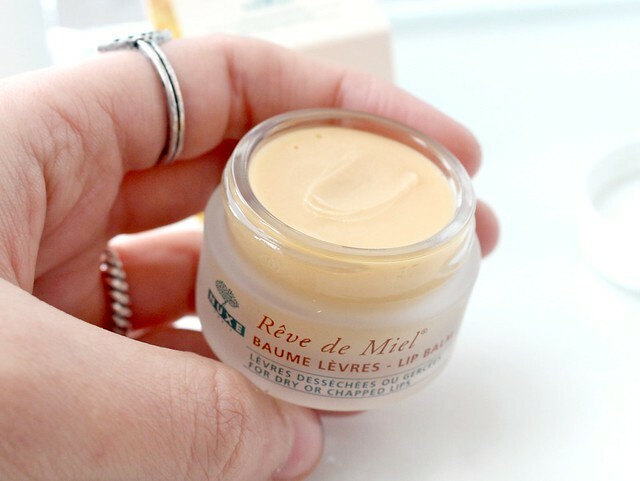 Overall, I'm a big Reve de Miel fan and I can see why one of these little pots is sold across the world every 28 seconds. Impressive stats but very well deserved. If you fancy giving it a try, its currently on sale for £6.33 here at Escentual. This is my fav lip balm & it lasts for ages! Love the lip balm, defiantly one of my faves! this sounds amazing and looks lush! This is so cute! I love lip balms, but I usually prefer the ones in tubes. It's a bit of a hygeine thing for me haha! I am french , so I always keep an eye on Nuxe. I love their new natural line Bio-beaute. Have your tried? I've heard such good things about this, I might try it out once my Elizabeth Arden lip balm runs out. Oh this lip balm really is so good - I have a pot next to my bed and absolutely swear by it. I've been meaning to test this out myself for ages! Oooh I ordered a pot of this a few days ago, I keep reading such positive reviews so I can't wait to try it. My lips are a disaster zone so I need it to live up to the hype! I love this lipbalm. I bought it one day as I have really dry lips and it is great. I love applying it at night and wake up with soft lips. So glad I bought one of these recently, I've heard nothing but good things about it. Can't wait for it to arrive now! I've heard so many great things about this product, I need to try it! I absolutely love this lipbalm, I bought two when I was in France as they charge waaaay too much for it here in Australia! I love to lather it on before I go to bed because it definitely feels too thick to sport during the day! 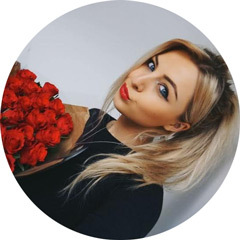 Lovely photography as always, lovely post! As a fellow dry-lip sufferer I bought the stick version of this lip balm for my handbag http://www.beautybay.com/cosmetics/nuxe/revedemiellipmoisturizingstick/ and it is great. I find myself needing to use it quite a few times over the day but it instantly improves my lips. I was literally going to pick this up the other day and didn't because it's on the more expensive side. Wish I had now! I still havent jumped on the bandwagon with this one, but it gets so many rave reviews it may be something I will have to consider when it gets colder. My lips always suffer then! I have heard about this but have never tried it. I always have dry lips so maybe I should give this a try. Is it worth the money? Have heard so much abour this lip balm! I seriously need to try it! This lipbalm is my HG of lipbalms, nothing leaves my lips smoother & as hydrated. I like to apply it at night & wake up with the softest lips. I haven't tried NUXE yet, but I hear great things about their products and how the work so well and that they smell amazing. I need to try the lip balm from them and other things since they are now in Target stores in the US.